Love. At. First. Sight. 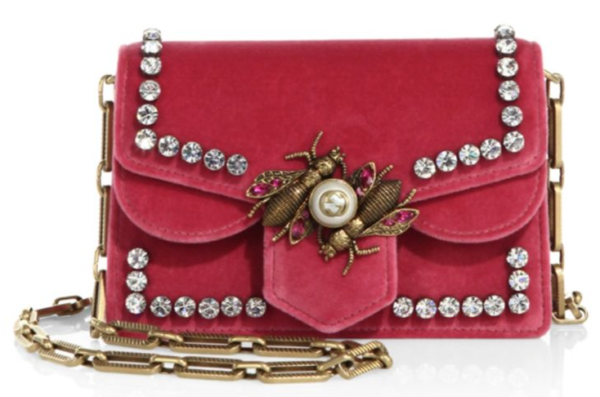 Okay, we realize this utterly gorgeous, super-luxe bag will set us back a chunk of change, but wow, with its special embellishments, it’s like jewelry really. Cue emoji with heart eyes. Plus, a bag always fits… it doesn’t care if you added an extra five pounds while traveling this summer or slacking on your workout routine. We digress…. Created in rich, raspberry velvet (or it comes in black if you prefer), every girl needs a perfectly pink, Elle Woods-inspired pocketbook. Just be sure you’re ready for the attention… and compliments that are sure to follow. If you can’t quite bring yourself to invest your next vacay stash, we found a lovely pink bag by 3.1 Phillip Lim for under $500 or Michael Kors has an even more affordable pink bag for less than $150. Add a pop of color to any neutral (black, navy, gray, camel, demin) or pair this pink beauty with a summer print to transition it to fall like we did below. (In addition, see how our model Mjellma wore this dress on Arizona Midday!) And, no one loves a great high-low pairing better than we do! A designer bag makes affordable fashion look more expensive. Join MSL & Kendra Scott for Charms & Cocktails!